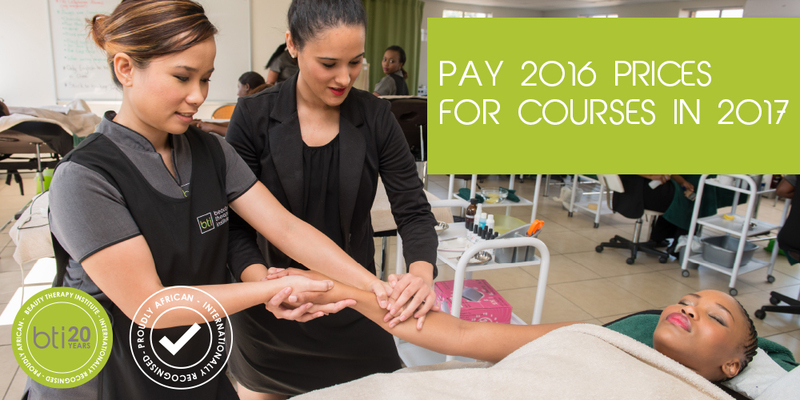 BTI, Beauty Therapy Institute (pty) Ltd, has been shaping beautiful careers since 1996, we have been committed to excellence by providing our learners with top quality trainers. We pride ourselves on offering flexible, part-time modular training courses in Health, Beauty and Skincare Therapy, so you can study at your own pace in your own time. Our small classes guarantee one-on-one attention, and all campuses are ITEC International registered/SAAHSP National. Take advantage of BTI’s 2016 Course Specials for 2017! Pay now for 2017 with 2016 prices. This promotion is available at all campuses. Valid untill the 31 December 2016.